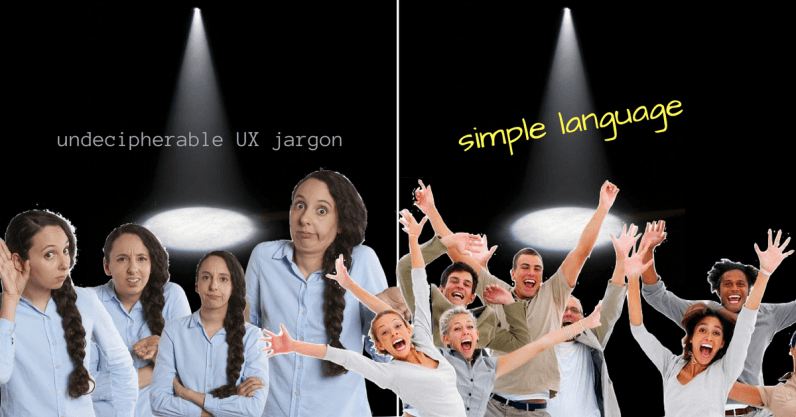 In many cases, the use of jargon is merely accidental — sometimes terms like “UI” or “parallax” will naturally come up as designers present the work to clients who have no idea what that means. In other cases, it’s a defense mechanism. Using complex words make people sound smart; make them sound like the perfect specialist in that topic. Which then enables them to charge more to solve the problem. Using plain English to explain each piece of the system you’re creating helps keep us honest and strips away unnecessary complexity. As a result, the interface itself becomes more honest, simpler. So does the user’s experience while interacting with your product. But our industry requires designers to sell themselves as specialists. In certain places, simple, accessible language can be seen as ignorance. The corporate world gets excessively excited with the jargon it creates and loses track of what is natural or unnatural to say. As a new technical term comes out, hundreds of courses, talks, e-books and blog posts start to pop up — claiming to teach you everything you need to know about [buzzword goes here]. You spend tons of money trying to catch up (“early bird tickets for only $999!”). When you finally overcome your impostor syndrome and feel confident enough to repeat that term out loud, the first thing you do is to update your Linkedin profile with that keyword — eventually fueling that same anxiety in other people. We spend hours trying to solve the problems we create for ourselves. The best UX designers I know can not only design interfaces that are simple to understand and use, but can also communicate in a simple and human way. They are thoughtful enough to simplify what they are saying or writing, simply because they care about the people receiving the message. At some point in your career, creating great experiences for other people becomes more than a habit; it becomes a mission. And it ends up spreading to every single aspect of your life.